Associated Press Karissa McLaughlin and her Boilermaker teammates will face the rival Hoosiers today in West Lafayette. 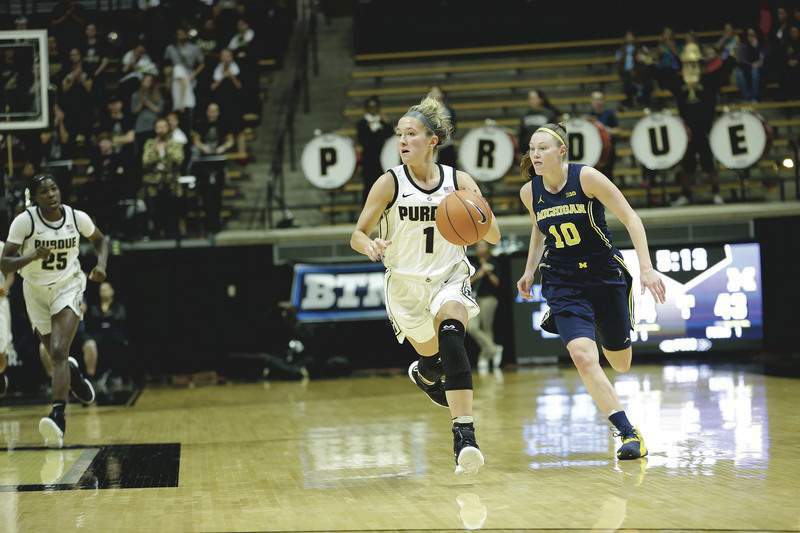 WEST LAFAYETTE – The Purdue women's basketball team has high hopes for this season. The Boilermakers are hoping to return to the NCAA Tournament and compete for a Big Ten title. When the team met before the season, however, their top priority lay elsewhere. Not only did Indiana beat Purdue three times last year, but the Hoosiers also ended the Boilers' season with a win in the third round of the WNIT. The Boilermakers have their first chance to make good on their goal today when they face the No. 25 Hoosiers at Mackey Arena in a matchup of teams tied for second place in the Big Ten standings. McLaughlin, a Homestead graduate, is Purdue's second leading scorer at 15.5 points per game and averages a team-best 4.2 assists while shooting 38.2 percent from 3-point range. In addition to the unfinished business the Boilermakers (13-6, 4-2 Big Ten) have with Indiana, McLaughlin has some of her own with one particular Hoosier. In the 2015 Class 4A state championship game between Homestead and Columbus North, McLaughlin's Spartans led by 11 in the second half before Bulldogs guard Ali Patberg rallied her team to victory. Patberg scored 31 points in the game and McLaughlin hasn't forgotten. This past offseason, Patberg transferred to Indiana from Notre Dame and now leads the Hoosiers (15-3, 4-2) in scoring (17.8 points) and assists (5.1) and is second in rebounding (6.1). The emergence of the 2015 Indiana Miss Basketball has helped Indiana weather the graduations of program cornerstones Tyra Buss and Amanda Cahill. The Hoosiers are a more balanced team this season without those two long-time leaders. They have four players – Patberg, Brenna Wise, Jaelynn Penn and Bendu Yeaney – averaging at least 9.9 points, making game-planning for them more of a challenge than in years past. Both teams enter the matchup coming off of close losses. The Hoosiers fell to Northwestern on Wednesday, their second defeat in the last three games. The same night, Purdue lost a road game against No. 20 Rutgers in overtime despite rallying from a 14-point deficit with less than five minutes to play in regulation. For the Boilers, it was a missed opportunity against a team that is undefeated in Big Ten play. It was also indicative of a trend that could make them better as the season goes on: the 65-63 loss was their fifth straight decided by seven points or less. Note: Purdue will honor the 20th anniversary of its 1999 national championship team with a video at halftime.